With boxing it can be difficult at times to decide whether to cheer, laugh or cry and that’s how it appears right now. 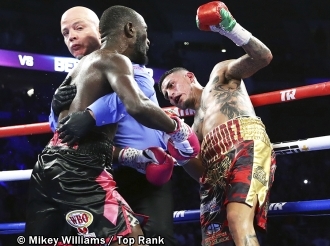 We have just enjoyed a master class from Terrence Crawford when beating Jose Benavidez. The show reportedly drew the highest US viewing figures this year for any boxing show either broadcast or cable this. We have Tony Bellew lining up to fight Olek Usyk on November 10 with all four cruiserweight belts on the lined. Saul Alvarez is moving up to fight Rocky Fielding for the secondary WBA super middleweight title on 16 December, we have a very competitive WBSS super light tournament on the go and a bantamweight tournament that holds out the possibility of some very tasty fights, Vasyl Lomachenko will try to unify the WBA and WBO lightweight titles when he faces Jose Pedraza on 8 December and Mikey Garcia looks set to defend his IBF lightweight title against Richard Commey. If Garcia wins then a Lomachenko vs. Garcia fight will be an immediate topic of conversation. On 22 December Josh Warrington will put his IBF featherweight title on the line against Carl Frampton and of course there will be a huge WBC heavyweight title fight between Deontay Wilder and Tyson Fury on 1 December with combined records of 67-0 and two very different styles and very different people. Plenty there for our pleasure. The laugh or cry comes in with Floyd Mayweather Jr having trouble not being the big super star so announcing he is going to fight some UFC guy named Khabib Nurmagomedov on 31 December. After that somehow he will fit in another fight with Conor McGregor-once was more than enough-and then Manny Pacquiao-once was more than enough-with Mayweather claiming that he estimates his purse for Nurmagomedov could be $110 to $200 million. Hell I didn’t realise there were that many idiots in the world. This isn’t about boxing it’s about an ego that can’t stand not being the main man in the headlines. I am tempted to shout for Nurmagomedov. 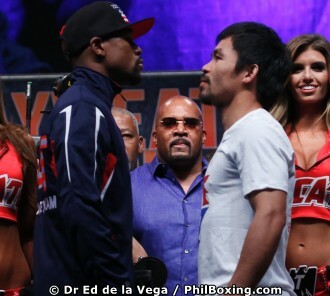 Manny Pacquiao did not help my mood by saying he expected to fight Mayweather on 5 May. Looking at some of the above obviously the call now is for a Crawford vs. Errol Spence fight which would be a great event. The snag as it often is is the respective contracts Crawford and Spence are under. It would mean Top Rank and ESPN for Crawford doing business with Showtime for Spence but for a fight this big there will be plenty of incentive for the parties to find a way to make it happen. For those interested in money-as I am-Crawford’s purse for the Benavidez fight was $3.625 million and Benavidez took $500,000. Crawford vs. Spence would be much bigger then that but let’s hope the Crawford keeps his hands to himself at any face-to-face stuff. For Alvarez vs. Fielding the obvious size difference is a factor with Fielding having been over the light heavyweight limit in some of his early fights and Alvarez having weighed as low as 140lbs in his early days. Alvarez has never weighed more than 164lbs. The fight contract has a stipulation that at the second weigh-in to be held on the day of the fight neither fighter must be more than 10lbs over what he was in the original weigh in. It is also amazing how quickly the water flows under the bridge in boxing. A year ago Alvarez was going to throw the WBC belt in to the bin if he beat Golovkin this week he was feted by the WBC as a great champion and pictured proudly wearing the green belt. Obviously the huge agreement signed by Alvarez and DAZN guaranteeing Alvarez $365 million for 5-year, 11 fights deal has cause quite a stir. It seems a bit ambitious to me. No one knows what will happen next week in boxing let alone five years. At the beginning of 2017 Roman Gonzalez was recognised by some as the No 1 pound-for-pound fighter yet by September after his second loss to Srisaket he was being written off. A win for Rocky Fielding would make that deal look pretty silly. Of course Manny Pacquiao is still on the scene and he has confirmed he will fight Adrien Broner on 12 January. Manny has stayed around too long. His legacy is huge enough for us to forgive him for this but he needs to walk away soon. The last of the HBO boxing shows will be held on 8 December. No venue yet but it will feature Roman Gonzalez and Norwegian “First Lady” Cecilia Braekhus. The 37-year-old Colombian-born Braekhus will be defending her IBF, WBA, WBC, WBO and IBO welterweight titles. An amazing fighter. There is plenty of talk of Gonzalez challenging WBA super fly champion Khalid Yafai down the line. In the meantime Yafai is set to defend his title on the big Monaco show against No 13 Mexican Israel Gonzalez who lost to Jerwin Ancajas for the IBF title in February. Jaime Munguia is determined to be a busy champion. He will fight on either 7 or 15 December and if it is the 15th then it will be a main support to Alvarez vs. Fielding. The name being bandied about as his opponent is 13-0-1Takeshi Inoue. Don’t worry Jamie I don’t think he is any relation to Naoya Inoue. The WBA’s stupidity is showing again. On November 24 on a big show in Monaco Denis Lebedev will defend his ???? WBA title against American Mike Wilson. Putting aside the fact that Wilson has never fought any opponent remotely near to world rated (he is No 57 in the BoxRec ratings) the ???? is there because according to Matchroom Boxing Lebedev is defending his WBA cruiserweight title. The WBA super champion is Oleg Usyk, the secondary champion is Beibut Shumenov and the interim champion is Arsen Goulamirian and poor Denis is “champion in recess” so no matter who wins the WBA do not have a title for him. Lebedev has come out of “recess” so will want to know where his title is and they can hardly put Wilson in recess if he wins. The WBO had their well-oiled ratings elevator working. Last weekend Angel Acosta defended his WBO light flyweight title with a second round kayo of Mexican Abraham Rodriguez. The challenger had a very impressive looking 23-1 record. So it’s okay as long as you ignore that in his last two fights he lost in March on a fifth round retirement against a guy with a 6-2 record so naturally he was not in the ratings. In July he won a six round fight against a fighter with a 4-9 record and that was good enough to get him a No 11 rating and a second round crushing kayo from Acosta. Oscar Valdez will return to action on 12 January. No opponent named yet but it will be a defence of his WBO featherweight title with the plan then being to go for a unification match with the winner of Warrington and Frampton. British heavyweight action will see Hughie Fury attempt to make himself the mandatory challenger for Anthony Joshua’s IBF title by beating Bulgarian Kubrat Pulev in Sofia on 27 October. A very winnable fight for Fury. In December it looks likely that Dillian White will face Dereck Chisora in what White must be hoping is the last fight he has to take before getting a return against Joshua. The Philippines has only one world champion right now in WBO minimumweight title holder Vic Saludar (Pacquiao holds the secondary WBA welterweight title so not a world title in my reckoning) but that could change on 24 October when Randy Petalcorin (29-2-1) takes on Nicaraguan Felix Alvarado (33-2) for the vacant IBF light fly title. It will be Alvarado’s third shot at a title having lost to Kazuto Ioka for the secondary WBA light flyweight title in 2013 and to Juan Carlos Reveco for the secondary WBA flyweight title in 2014. Joseph Parker will return to the ring on 15 December in Christchurch. His opponent will be Alex Flores. Flores has a 17-1-1 record with 15 wins by KO/TKO but again don’t look too closely. In 2014 he lost inside the distance to Charles Martin and boxed a six round draw with an opponent who was 4-4-2. He had one fight in 2015, did not fight in 2016 and had one fight in 2017 and one fight in June this year all against low level opposition. Should not be a hard task for Parker. A little while back there was a problem in South Africa with visiting-and home- fighters not getting paid. It was a disgrace mainly because the rule on purses being lodged before the fights was not enforced. I thought things had improved but the influential South African web site “Sowetan Live” carried a story that seems to indicate there is still a problem. The paper alleges that the promoter did not have the money to put up before Gideon Buthelezi defended his IBO title against Lucas Emanuel Fernandez East London on 27 July. With the promoter unable to pay Buthelezi the amount he was due the fight was going to be cancelled. However an official in the Boxing South Africa Board (BSA)convinced Buthelezi to agree to sign a contract for a sum of about approx $1,400 and BSA reportedly paid him that amount with the promise that the balance would be paid later by the promoter. Nearly three months later Buthelezi is still waiting for his money. The promoter did not have the money at fight time but had partnered with the local municipality for the $30,000 needed and has assured Buthelezi he will get paid. The municipality said that it had approved the request from the promoter and that it was with their legal services and if there were no legal challenges the sum would be paid to the promoter and Buthelezi can only hope the promoter will then pays him. If the Sowetan’s allegations are true then as both the BSA and the IBO experienced this before they don’t seem to have learnt anything from it. The IBO can say that it is a domestic problem but the name of the IBO was on the title fight and it does not reflect well on them that the same thing has happened again. It would seem the BSA took this action to ensure the fight went on and in view of their promise to Buthelezi and as he is licensed by them they have an obligation to make sure Buthelezi gets paid and that this does not happen again. Danish Hall of Fame promoter Mogens Palle has a show coming up on 24 November. He is bringing in former interim WBA Middleweight champion Dmitri Chudinov as a very tough test for his Danish light heavyweight prospect Jeppe Morell. Next year Palle will celebrate 60 years of promoting fights. Some achievement. Former WBC light heavyweight champion Jean Pascal will get one more shot at the big time. After a number of outside the ring problems it seemed that he was going to retire but he has landed a shot at WBA champion Dmitry Bivol in Atlantic City on 24 November. Unbeaten Russian heavyweight Evgeny Tischenko is schedule to fight on the undercard. Something that could bring tears to your eyes is the disappearance of two building in Detroit. The Kronk gym was demolished and the Joe Louis Area is closed and going the same way, It appears that the closure and sale of the land where the arena stands has had to be undertaken as part of the restructuring deal to get the City out of bankruptcy. It is ironic that they have been selling off the seats from the arena for a few months and have raised over a $1 million, It took Joe Louis 17 years to earn $4 million.